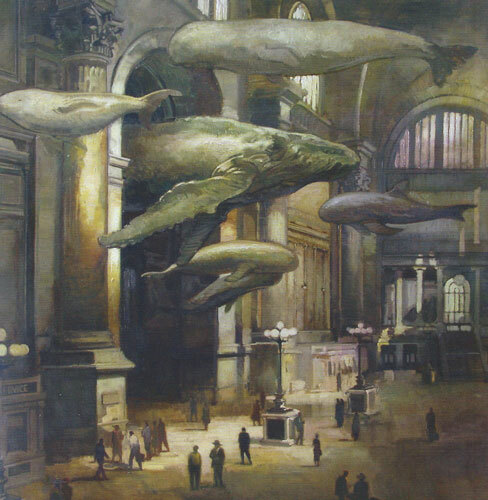 Francis Livingston, Rush Hour, oil, 60"x60"
Commuters clad in shades of gray and brown trudge through cathedral-like Penn Station, an architectural landmark of New York City's Gilded Age that was demolished in 1963. Overhead, seemingly unnoticed, whales big and small glide through the lofty spaced, which once rivaled St. Peter's Basilica in Rome. What, exactly, is going on here? A dream? A fantasy world? An alternate reality? For Livingston, any particular explanation was beside the point. What excited him most was the opportunity to capture the somber mood of a long-gone monument; to portray a magnificent scene in muted colors; and, perhaps, to pique viewers’ imaginations with a speculative nudge akin to, “Wow, wouldn’t it be great if ...?” You might label the overall effect a hybrid style called retro-futuristic surrealism. “Yes, that’s a perfect way to frame it,” says Livingston enthusiastically. “It gets back to the painting’s narrative quality. There’s a bit of a story there. People can get absorbed with it.” “Absorbing” is another apt descriptor for Livingston’s works. Painting after painting draws viewers in, inviting them to linger, to wonder, to explore worlds seemingly suspended in time. So, not surprisingly, he entered Denver’s Rocky Mountain College of Art & Design, an institution founded by Philip Steele, an artist who had studied at New York’s Art Students League under figurative artist George Bridgman, himself an erswhile ghost-illustrator for a popular Sunday action/adventure comic strip called Captain Easy. “So I thought, maybe I can learn some things about comics in this school,” Livingston remembers. 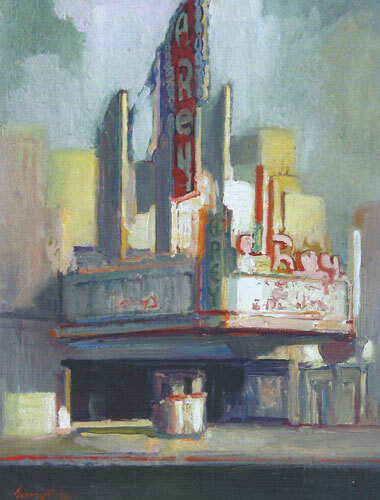 What Livingston got during the two-year course was “a fairly general, all-around commercial artist’s training.” Upon graduating, he quickly discovered that “the call for illustrators in Denver was not that great, and, besides, I didn’t really have much of a portfolio.” So he decided to continue his education even more seriously. Straight out of the Academy and living in San Francisco, Livingston began getting assignments. He drew pen-and-ink illustrations for local magazines. Textbook publishers hired him to paint historical scenes of events ranging from the Revolutionary War to the exploration of Antarctica. He developed a reputation as one of the few illustrators in the city specializing in beautifully realized oil paintings. He secured agents to represent him on both coasts, getting still more plum assignments including the covers of major corporate brochures and annual reports. “It was a quick jump-start,” he says. That gave Livingston the push he needed to produce his first gallery works. He was further inspired by a visit to a New York show featuring haunting watercolors of Coney Island by David Levine, an illustrator best known for his pen-and-ink caricatures skewering writers, politicians, and other noteworthies in The New York Review of Books. “I was blown away by the kind of grittiness you might see from Ashcan School painters like George Bellows or John Sloan,” he says. “They were just what I had in my own head.” In 1994, Livingston’s first show of moody Santa Cruz oils at the new Thomas Reynolds Gallery in San Francisco won him positive recognition. It also propelled him into representation by still more galleries nationwide, he says. 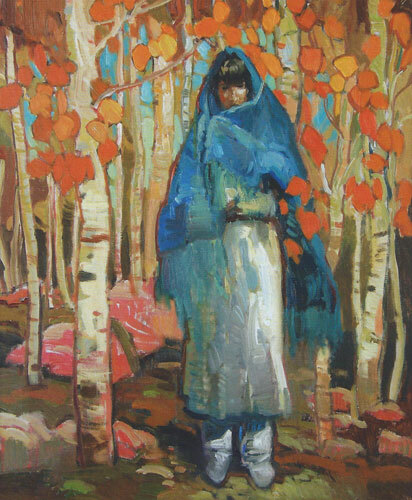 One of them, Medicine Man Gallery in Santa Fe and Tucson, encouraged him to create a continuing se­ries of Southwestern-themed paintings. 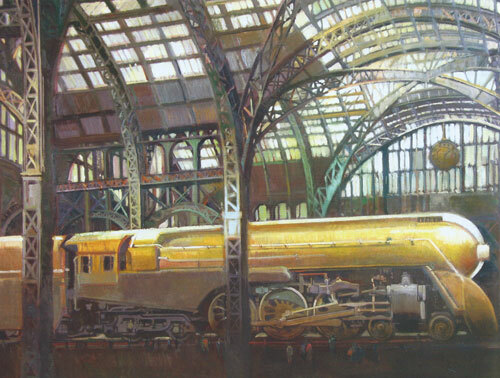 Francis Livingston, Steam Powered, oil, 40"x60"
Then, after he tones the surface with a neutral color, the actual painting begins. “I work from a middle tone, then go a little bit darker and a little bit lighter, and I don’t lay in the darkest or lightest colors until the very end,” he says. Despite the narrative qualities the finished work might possess, he says, “I stray from my reference materials pretty quickly. I let the painting start dictating how it winds up.” Eschewing tight realism, he adds, “If I see too much detail, or it starts looking too photographic. I’ll scrape the paint with old credit cards or a piece of cardboard, or throw on some turpentine to let it drip. Doing that loosens me up psychologically and gives me little textures and surprises.” Francis Livingston, El Rey, oil, 20"x16"
Francis Livingston, Harmony, oil, 20"x16"